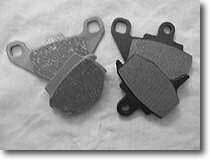 EBC Carbon Graphite “X” pads are ideal for canyon carvers or heavy brake users in dry conditions. They work well with the Supermoto oversize floating front brake disc. Carbon graphite formula runs cooler and less prone to brake squeal.